← Do we need rivers to secure water for development? 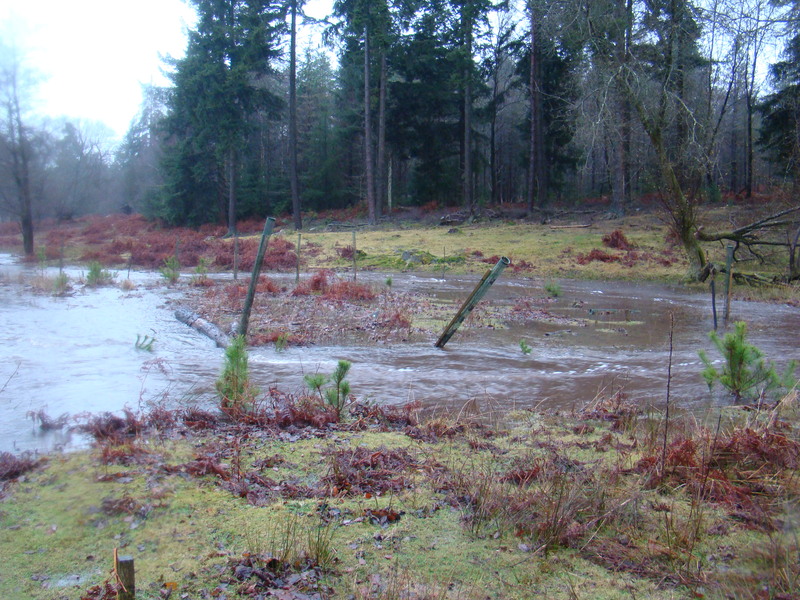 Regular readers of the blog will remember a few years ago I blogged about some of my PhD research on trying to assess how changing volumes of wood in rivers affects the likelihood and magnitude of flooding. At the time I felt the work was stuck in a metaphorical publishing logjam and thought it would be a while, if ever, before it got published in a journal. In a wonderful piece of serendipity a colleague who was editing a special edition of the journal Earth Surface Processes and Landforms read the blog and thought the work would be a good fit and so invited me to submit it. The paper was recently peer reviewed and accepted for publication. I mention this as an anecdote to counter what academics are sometimes told about blogging damaging chances of publication, or being a waste of time. Following the work being through the rigours of peer review I thought it was a good time to revisit it and reblog the major findings* now it’s all scientifically official! The background to this work is that we know if wood is put into a river then flood water moves slower through/around it, and thus for a short distance downstream flood water will have a longer “travel time”. What no-one has done before is look at the effects upon flooding at a distant downstream location (such as a town) of changing the speed water moves through a small sections of the river catchment upstream of it. What we were interested in, and what the EA provided funding to look at, is how changing land use and/or changing in-stream wood quantities (particularly in the context of river restoration) could change downstream flood behaviour. This idea of natural flood risk management is a really hot topic recently covered on Countryfile, The One Show, The Today Programme and many more. To investigate land use and flooding we used a computer model called OVERFLOW which was also used for the experimental “soft engineering” flood defence project at Pickering, N.Yorkshire which has received a lot of attention since this winter’s floods. 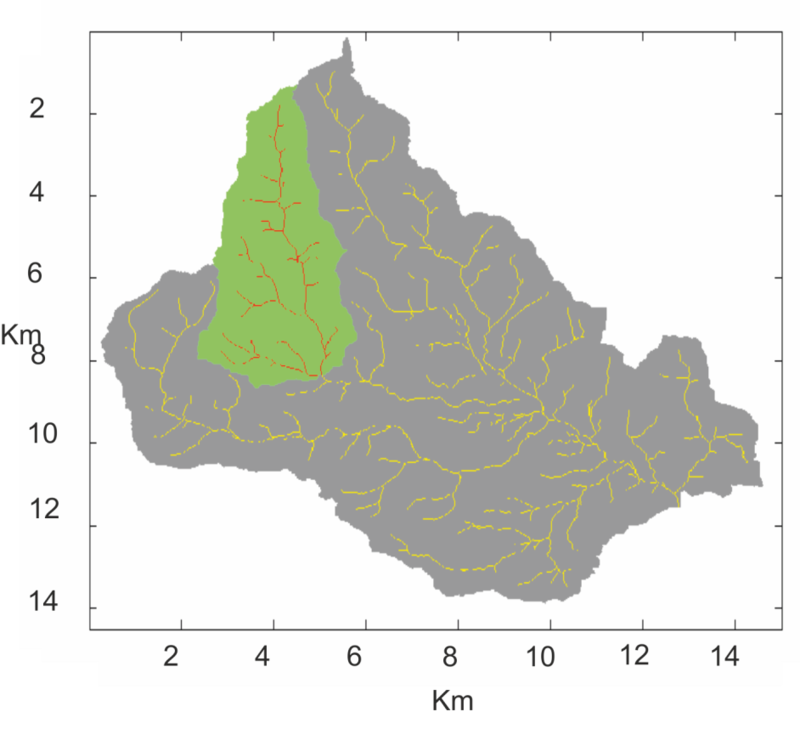 This model allowed us to run thousands of model variations to look at the effects of changing wood in rivers and changing afforestation at a wide range of scales, but also different spatial arrangements within a catchment. In order to set up and calibrate the model we used data on topography, land use, rainfall and river levels for a catchment within the New Forest National Park – the Lymington River. We were principally concerned with the depth of water near the town of Brockenhurst. The real benefits in “rewilding” for flood control comes from restoring floodplain forests. Complex forested floodplains dramatically slows water moving over them as they have an irregular surface covered by tree roots, upright tree trunks and dead wood. Our model runs for scenarios where wood is inserted into the river and a forest is allowed to grow on the floodplain show substantial and predictable responses in downstream flood height. This Figure from the paper shows the spatial pattern of flood response to very small areas of afforestation (A=~25yr, B=~50yr, C=~100yr). Note how upper parts of the catchment are neutral or blue (reduce flood risk) and areas close to the outflow (bottom right) are red (increase flood risk), and how this pattern gets stronger as the forest ages (A-B-C). This conceptual model from the paper illustrates the concept of “sub-catchment desynchronisation”, and explains how slowing the flow in one place can make flooding worse elsewhere. It is important to note that this modelling only looks at the speed of water moving through the river network and off hillslopes, it does not take any account of the reductions predicted in the amount of water reaching rivers through trees increasing infiltration rates of rain/runoff into soils, as George Monbiot has talked about extensively. So we could expect to see even greater reductions in flood peak discharge downstream than predicted just from flood wave travel time modelling. In conclusion although governmental and public interest in the concept of “rewilding” rivers for flood control is promising, it is important to recognise that the local effects of wood in rivers slowing flow can have surprising and counter-intuitive effects when looked at in the context of a whole river catchment. We need to do a lot more work in this area and in the meantime the insertion of logjams and dead wood into rivers for flood control should be used with caution and extensive site analysis. Scientifically the case is getting much stronger for targeted afforestation of uplands as a part of natural flood risk management. *- elements of this post have been copied from the early blogpost linked to above. Simon. Just out of interest, did you model tree planting in the upper to mid catchment and then additionally model the effect of adding in forestation of the lower catchment? Interested to know whether it could add to the positive effect in any way, or still have a negative effect. Is it possible to find roughly how far (in % terms) up the catchment the ‘cut off’ point occurs, or is that wholly dependent on catchment characteristics? I think it’s really going to be dependent on catchment characteristics. One of the types of scenarios we didn’t do was looking at large blocks of woodland positioned only somewhere in the lower catchment as targeted planting. We did look at isolated blocks of woodland of ~2-3km^2 positioned all around the catchment, as well as blocks of ~10-15km^2 and these didn’t tend to have a huge impact one way or another, certainly when compared to the planting from the catchment source/boundary downwards. Effectively the way I interpret it is that planting an isolated block of woodland acts like a “speedbump” on one particularly tributary or branch of the network, and although this might have a big local effect, in the context of a whole catchment that relatively short section of slowed water may not have a big impact. Whereas if its possible to slow the passage of rain within a whole sub-catchment area from the point it hits the ground to the point it “exits” the sub-catchment and joins a wider part of the channel network it’s going to have a greater potential to be decoupled from the main flood wave. Because of the nature of the modelling approach we used it’s better to talk in terms of probabilities and patterns, rather than exact numbers (which is why all of our results are presented as % change), so I’d be reluctant to put a firm number on where the change from +ve to -ve change to flood risk occurs in respect of small scale forest planting. The outflow of the catchment (in the model) is a 5th order channel (based on how we calculated headwaters) and broadly speaking it seems as though subcatchments flowing into the main channel when it is 3rd order are positive to reduce flood risk, the shift occurs in our catchment somewhere in the 3rd-4th order main channel (i.e. smaller sub-catchments flowing into the 4th order channel are variable in effect). The place at which this happens for any given catchment is really going to depend heavily on individual catchment characteristics though. It’s also important to say that we’re just talking about general patterns and biggest effects. It IS possible that in a specific catchment a block of woodland in the lower catchment might have some positive, measurable effect at reducing flood risk – we’re certainly not ruling it out, just saying the work suggests its less likely. Thanks Simon. Now we’ve had the theory, wouldn’t it be nice for those agencies with the necessary clout to crack on and make it happen in practise. After all, it’s going to take decades to take effect and if it doesn’t work well, we could always chop them down again for firewood. Or is that too practical! I think there is something to this. Eventually we (as a society) have to take a leap of faith based on the best science available and just do it, or decide afforestation for flood management is not for us. In the end it’s just not practical to set up full scale natural studies and wait 50-75 years for conclusive results and then (if it works) wait another 50-75 years for the subsequently approved roll out of more forests to grow! There is also the joke – “What if we’re wrong and we create acres of beautiful mature woodland for nothing?”!! I was delighted to read about your research on the effect of large scale tree planting on reducing the flood effects downstream. While we all talk about the benefits of trees, little work had been done before to prove this in such scale. As you can see in my website (http://ky59.blogspot.com) I have been promoting such ideas, mainly using ancestral technologies, as an alternative to typical ‘engineered solutions’ to flooding. I would like to use your research results in my new book on “Ancient water nurturing practices” (the spanish version was written in 2012) for the benefit of practising technicians. Unfortunately, I am an independent researcher in Ecuador and my minuscule budget does not allow me to buy your article at Wiley web site. Besides, I would like to add detailed information about your research in my book so that people from other geographical locations can experiment on their own and learn what produces the best results.